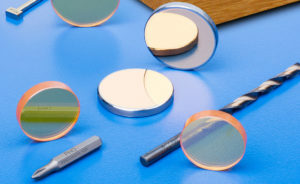 These silicon turning mirrors are ideal for reflecting the beam of a CO2 laser for angles of incidence from 0 to 45 degrees. TM Series mirrors are designed and manufactured for high reflectivity and optimum durability in rigorous industrial environments while maintaining a good laser mode. Either single or dual band coatings may be specified by replacing the “EC” designation with “DBMR” in the Part Number.